Editor’s Note: This is Part One of a series on the Calderon family. It wasn’t quite the Academy Awards. But the 60 or so people assembled last Saturday afternoon at the Whittier Center Theatre were excited just the same. 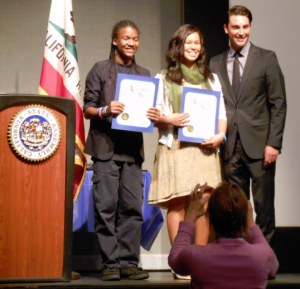 The festival, a digital media competition organized by Assemblyman Ian Calderon, D-City of Industry, in conjunction with the California Arts Council, featured the works of 58 area high school students, who produced short clips on human rights and genocide. The nearby picture shows Calderon with two students getting awards. The kids were vulnerable — putting their creations up for judgment by the community. It’s something Ian knows about. Earlier this year, when he and two of his legislative colleagues released their own digital media creation, a surfer’s perspective on coastal protection, Ian’s father expressed his misgivings. The old political rules, Ian says, no longer apply. Yet, he understands why it took some time for his father to come around. “The old guard keep things close to the vest because that’s when they come after you,” Ian said. This week, everyone seems to be coming after the Calderons. No sooner had FBI agents executed a search warrant at the Capitol offices of Democratic state Sen. Ron Calderon, Charles’s brother, than the press was churning out headlines about the “political dynasty” mired in scandal. “Sen. Ron Calderon, target of FBI raid, is part of a political dynasty,” read the headline of one LA Times piece. The Times wasn’t alone. Almost every major outlet has repeated some version of the “Southern California political dynasty” storyline. The Calderons have certainly made politics the family business. Charles, the eldest brother, started it off in the Assembly in 1982, followed by middle brother, Tom, in 1998, then Ron in 2002. Last year, Ian, the surfer son, won a hard-fought campaign for his own seat in the Legislature. The dynasty storyline is easy and convenient. It’s also an oversimplification of the major differences among the Calderons. The people who know the Calderons best, old friends, current and former staffers, community leaders, and Sacramento lobbyists, say that each of the Calderons has brought a unique style and approach to the family business. Far from speaking with a uniform voice, the Calderons often have had heated political disagreements within the family and been on opposite sides of controversial legislative fights. The FBI says it won’t comment on the ongoing investigation, which has only intensified the Capitol rumor mill. The best evidence suggests that the FBI is investigating Ron’s relationship with the Central Basin Municipal Water District, where Tom has worked as a high-priced consultant. At least one state Senator, Kevin de Leon, D-Los Angeles, has confirmed that he has been subpoenaed. That Ron and Tom are the subjects of the FBI investigation, without any evidence to suggest that either Charles or Ian is involved, doesn’t surprise many Calderon confidants. When speaking candidly on background or not for attribution, these individuals described two brothers in conflict with Charles’s reputation as an honest broker and effective legislator. Last Thursday afternoon, I sat down with Charles Calderon just a few blocks from the Los Angeles City Attorney’s office, where his professional career began as a deputy city attorney. Under then-City Attorney Burt Pines, now an LA County Superior Court judge, Calderon got his start prosecuting misdemeanor cases that ranged from assaults to drunk driving. “My dream was to be a lawyer,” Calderon explained. After two years, he moved into private practice, while also serving on the school board. Almost immediately, Calderon took up a low-paying, controversial school desegregation case representing a group of white, black and Latino parents that had already been turned away by the NAACP and MALDEF. Calderon’s clients claimed that the Centinela Valley Union High School District had closed a Lawndale high school in order to prevent integration of other high schools in the area. It was an uphill battle; the parents had to show intentional segregation. So Chuck, in search of any evidence to show de jure segregation, headed down to the school district headquarters to review years of board minutes. A year later, Charles was up and on his feet, walking door-to-door in his first legislative campaign. That first election, he estimates, he walked 98 precincts. He’d walk one side of the street, his mother the other side. You might have mentioned that Chuck was a legislative staffer for former Assemblyman Jack Fenton.